The Content Strategy MasterClass is way more than a book or a guide for content strategy. Instead, it's an invitation to advance where you are now, to a more holistic place where content strategy intersects with technology, pre-defined products, and communities that combine to drive success. The content marketing revolution is in full force. But for content marketing to achieve these demanding goals, content strategy needs to lead the way. As it turns out, content strategy is not that difficult to learn, thanks to the latest technological and methodological advances over the last few years. Developing a content strategy, however, is an art and science. It’s the art of listening and learning the wants and needs of your customers. It’s also the science of developing content that's rooted in big data, transforming browsers into believers, and believers into buyers. 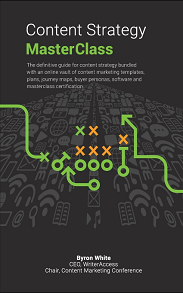 In this book, you'll learn the fundamentals and so much more, and you'll benefit from wisdom learned over the years by working with thousands of WriterAccess customers and strategists to deliver on their content marketing goals.